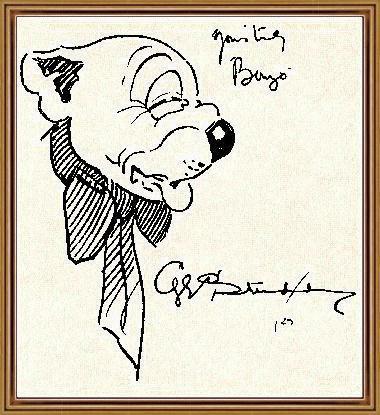 The name 'Bonzo' is as well known today as it was when he first appeared in 1922. More than seventy five years later, he is still widely collected in postcards and figurines. Why does this little dog remain so popular, and what is known about his background? This site takes you through the history behind Bonzo, the famous cartoon character created by George Studdy. There is a biography of the man himself, the transcript of an article by him from 1926, more info on Bonzo, an interview with the authors of the definitive book on Bonzo, and lots of lovely and rare pictures! If you have any comments, questions, or just wish to chat about Bonzo or George Studdy please e-mail me, I'd welcome any feedback from fellow collectors / Bonzo nuts! Let me know if you have any items for trade or sale, or that you are desperately looking for - maybe I can help you! I hope you enjoy your visit. A Biography of George Studdy - The story behind the Bonzo man. This page is full of background information and has lots of illustrated links! Who IS Bonzo? - Includes a description of Bonzo by his creator, and even more pictures! The George E. Studdy Archive - A collection of as many of the printed works of Studdy's that I've been able to track down. Bonzo Memorabilia - A selection of many of the collectable items made in Bonzo's image throughout his era. *NEW* The R.John Wright Bonzo - A wonderful new addition for all Bonzo collectors! My Method - by G.E.Studdy - An article written by Studdy in 1926. An Evening with Paul Babb & Gay Owen - a pleasant chat with the authors of the definitive book on Bonzo. BONZO - The Life and Work of George Studdy - How to secure your very own copy! Studdying with Bonzo - Link to Reg Richardson's site featuring check lists of Bonzo and other Studdy printed matter. The Bonzo Dog Doo-Dah Band - They took his name, but did they share his humour? Check out Ian Kitching's great site.